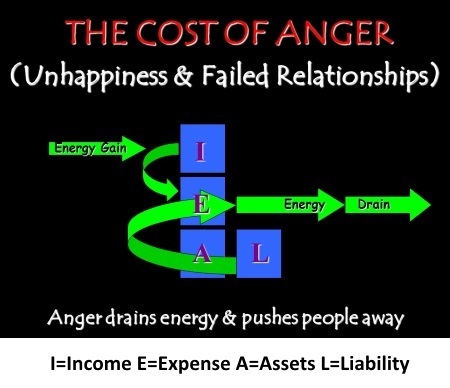 Dr. DeFoore's Healing Anger Newsletter entitled "Anger Is Expensive"
Well, you actually don't have to buy anger...but it costs you a lot if it comes out in unhealthy ways. First, let's look at how it costs you, and what it costs you. Unhealthy anger takes a toll on your health. It raises your blood pressure, increases your heart rate, and makes you more vulnerable to cancer. Toxic anger can cost you happiness and connection in your relationships with your partner, spouse, children and friends. Basically, this is because nobody wants to be on the receiving end of your anger. Unhealthy anger drains your energy. It's like sitting in your car and revving the engine without going anywhere...it's not good for the engine. Strong anger really doesn't have anywhere to go, because it's too destructive, and holding it inside takes a lot of your precious energy. And, if you really let your anger go out of control, it can cost you financially. You might break expensive things, wreck your car, or break the law, become violent and have to pay fines, lawyer's fees, etc. It could even cost you your freedom. Remember, we're talking about unhealthy, toxic anger here. Healthy anger actually adds energy, and makes your health and relationships better. Now let's keep going so we can figure out how to reduce your emotional expenses. "You were designed to be emotionally healthy, and to have a surplus of energy and enthusiasm to create the life you choose for yourself." First, you have to make up your mind to get emotionally healthy. You can do this, but only if you set your good heart and brilliant mind to the task. Just ask yourself...do you really want to live your life with enthusiasm and positive motivation? If the anwser is yes (and it is for most of us), then you have what it takes to get started. Now, here are some steps to take you further along the path. Just like with your finances, you have to reduce your liabilities and increase your assets. Example of assets would be healthy self-care, positive beliefs about yourself, and strong, healthy relationships. Liabilities would be things like explosive anger, depressive patterns, negative beliefs and dysfunctional relationships. Express your love. Make a list of the people you love the most, and write about all of the things you love about them. Then tell them, in a letter, email, phone call or in person. List any and all old, negative beliefs you have, then replace each one with positive, empowering beliefs. Make a committment to yourself to eat healthy and exercise regularly...never underestimate the power of these basic, simple practices of self-care. Become a Goodfinder. This is simply a matter of looking for and focusing on what is good, right and working about your life - past, present and future. This will build your sense of gratitude, appreciation and optimism about yourself, your loved ones, and the world around you. Each of these above steps will help you reduce your personal liabilities and increase your pesonal assets. 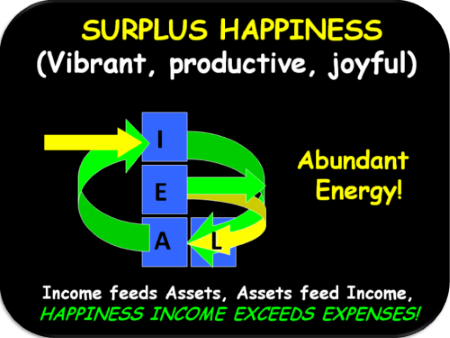 Learn more about asset-based thinking. This may be simple to understand, but when you begin truly applying and developing these skills, you will find it a very challenging process...and worth every ounce of energy you invest. You are far stronger, smarter and healthier than you realize. Consider that for a moment. This highly effective audio program, available as CDs or MP3 download, will help you understand and develop your emotional balance and well being. 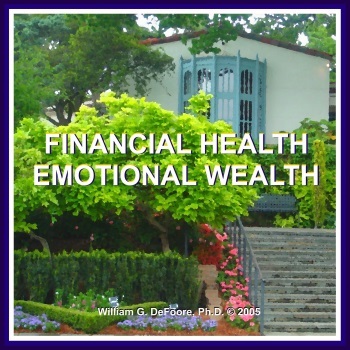 In this program, Dr. DeFoore will guide you through an understanding of how your emotions are like your finances, and you can operate at a deficit or surplus, whichever you choose. Get your copy now. New web pages for you. Read new contributions from good folks like you, such as Am I Provoking My Angry Husband by a woman who is willing to take responsibility for her part...perhaps to a fault, and I Want To Control My Anger Around My Highly Sensitive Child by an angry mother who wants to improve so that she can be the good parent that she wants to be.